In October I was working on a two-week project to catalogue the George R. Sims Collection at the John Rylands University of Manchester Special Collections and it’s now on the online catalogue. George Robert Sims (1847-1922) was a household name in the late nineteenth and early twentieth century. He was a prolific writer of popular dramatic works and credited with being the first person to have four plays running simultaneously in the West End. He was also a prolific author of novels and poetry and produced several volumes of memoirs. Interestingly, however, Sims was also a journalist, social campaigner and philanthropist and wrote at length over a great many years regarding the plight of the poor and was involved with several charities and is remembered for his poem ‘It’s Christmas Day in the Workhouse’. This collection is interesting because it contains a significant number of typescript volumes of his plays, which were not published and also actor’s and musician’s parts for the plays with annotations, which together demonstrate the content of ephemeral popular drama of the 1880s/1890s and also give something of the sense of how they were performed. Also of interest are manuscripts of several of Sims’s published novels and what appears to be an unpublished manuscript for a book on vagrancy in the 1890s, the only manuscript representation of Sims’s campaigning journalism within the collection. This collection also reveals the extent of Sims’s celebrity status as playwright, author, journalist and bon vivant. 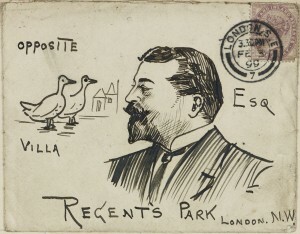 There are 4 volumes of scrapbooks, one of which is solely dedicated to published cartoon images of Sims and others containing letters, published articles and printed ephemera relating to the critical reception of his plays and also his social engagements, hobbies and home life. There is interesting posthumous material dating from the 1920s relating to the attempts of Sims’s widow to sell the rights to his works to silent film producers. The image of Sims above is testament to his celebrity status at the time. It is an envelope (one of a number found within the collection) which rather than having Sims’s name and address, only has a hand-drawn likeness of Sims. The two birds represent the location of his home, being opposite “The Ducks Villa”. What also comes across in the collection is Sims’s eccentricity, with several articles, printed postcards and photographic images of his dogs, who appear to have accompanied him to performances of his works and in particular a printed invitation to the ‘christening’ of his dog, Barney Barnato, named after a prominent Jewish diamond magnate. I have recently discovered George Sims and that he was a lifelong friend of Alfred Lord Tennyson. I also discovered that the Tennyson’s and Sims’s had a history of intermarriage between the two families. So looking back I thought George Sims must be a relative as my paternal grandparents were William George Sims who married Elizabeth Amelia Tennyson and both were Londoners. I realise that George could not be my great, great grandfather as he had no children but he may be a great, great uncle. My Great grandparents were William Sims who married Lillian Jones in 1895. Can anyone throw some light on this as I am trying to find more about my family tree. Unfortunately, there are no diaries in the archive and a very small number of letters which are included in scrapbooks. Sims had a regular column called ‘Mustard and Cress’ under the name ‘Dagonet’ in the periodical ‘The Referee’. Within the collection there are four large scrapbook volumes and these contain many cuttings from his journalism and it’s possible that there is mention of what you are looking for there. Sims also published an autobiography in 1917 called My Life: Sixty Year’s Reflections of Bohemian London. Tatcho was the name of the patent restorative hair tonic which Sims put his name and face to and was teased subsequently for and so it’s possible that your Tatcho is Sims. I’m temporarily curating the George Sims Archive during a colleague’s maternity leave. If you are interested in visiting the Rylands to consult the collection, just let me know how best to contact you and I can let you know about how to become a reader etc. I’m delighted that there’s so much interest in the archive! Just today I’ve looking for items on George R Sims in connection with some research on Rebecca West’s journalism, in London, during WWI. In a letter of 1916 she describes visiting a munitions factory with someone called ‘Tatcho’. So far I have not found any other references to him in her letters, etc. but I’m wondering if it is Sims. Did you notice any references to West, or are there likely to be any letters and diaries from this period in the archive? I have looked at the catalogue entry for Sims at Manchester, and realise the presence of such info doesn’t sound too likely, but anything you remember that sounds vaguely useful would be a great help. I’ve just started cataloguing Keith Waterhouse’s archive at the British Library and found that he also used Sims when researching his 1955 book on the Cafe Royal and bohemian London. I have been trying to find the time to visit Rylands for a number of years to take a look at this archive. Now that Matthew has comprehensively catalogued the collection it will make my visit very rewarding. I am related to George R Sims though my maternal grandmother who was his 1st cousin. The story as to how the collection reached Ryland is itself very interesting. There was renewed interest in George R Sims in late 1960s as a result of Arthur Calder Marshall’s book containing a number of ballads ‘ Prepare to Shed Them Now’ . In more recent years Social Historians have frequently made reference to the importance of his writings on Poverty, homelessness etc. A very good example is Stephen Inwood’s book: City of Cities: The Birth of Modern London published in 2005.